Today, joint owners Mirvac Group and ISPT held a Topping Off ceremony to celebrate the completion of the main structural works at their flagship office building in Melbourne, 2 Riverside Quay, Southbank. 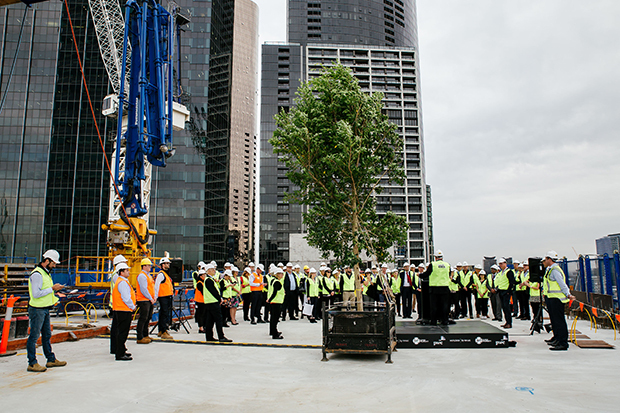 The event was attended by Lord Mayor of Melbourne, Robert Doyle; Mirvac’s CEO & Managing Director, Susan Lloyd-Hurwitz; ISPT CEO, Daryl Browning; Fender Katsalidis Architects Director, Karl Fender; and PwC CEO, Luke Sayers and was celebrated by craning a live tree onto the newly created rooftop terrace. Ms Lloyd-Hurwitz, said, “We are proud to reach this significant milestone in the Riverside Quay project ahead of schedule. We have worked closely with our partners and the City of Melbourne to transform Melbourne’s Southbank into a vibrant community space and office environment. “As a unique urban renewal project, Mirvac has incorporated the latest sustainability features and innovative building design to add 12 storeys of PCA A-Grade office space above an existing public car park. “The Topping Off ceremony today acknowledges the contribution to this great project by all parties involved and I would like to take this opportunity to thank them for their hard work. It’s an honor to celebrate this special event with Lord Mayor of Melbourne, Robert Doyle; ISPT CEO, Daryl Browning; Fender Katsalidis Architects Director Karl Fender; and PwC CEO, Luke Sayers. PwC CEO, Luke Sayers, said, "This building is in a prime location, in a world-class city, equipped with the latest technology to help us connect and collaborate with our clients like never before." "The purpose built workplace design will help us break down barriers and make it easier to bring our collective experience and expertise to our clients' most important problems." PwC has committed to 19,100 square metres over 11 levels representing 91 per cent of the total lettable office area with a 12 year lease. Mirvac worked in close collaboration with PwC to create the bespoke working environment that will become its new head quarters in Melbourne. Fender Katsalidis Architects has leased the final floor, bringing the building to 100 per cent pre-leased. 2 Riverside Quay will be one of Melbourne’s leading environmentally sustainable buildings, targeting a 5 star NABERS Energy rating and 5 star Green Star As Built. Designed by Fender Architects, the building maximises light exposure with a north facing outlook, as well as incorporating LED lighting through parts of the building. Working in partnership with the City of Melbourne, Mirvac has embarked on a unique community consultation process to shape the direction and renewal of the public domain at the base of the buildings. The space will be brought to life through its design to encourage public interaction. Set in a prime location along the riverfront of Southbank, directly across the Yarra River from Melbourne’s CBD, the precinct will offer panoramic views of the city. Riverside Quay also enjoys easy access to robust transport networks, with Flinders Street Station and major tram hubs located close by. The Riverside Quay precinct comprises of four individual buildings across a total of 52,300 square metres, with 2 Riverside Quay due for completion at the start of 2017.